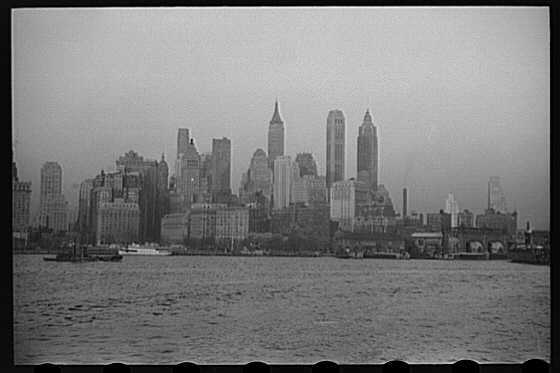 "Lower Manhattan seen from the S.S. Coamo leaving New York." "Luck of the Irish" because construction of it began on St. Patrick's Day, March 17th, 1930? Just a little interesting tidbit I thought you might enjoy. Here's another little tidbit for you. FIRE WILL FLY FROM THEIR LIPS! Here's ONE MORE tidbit about The Empire State Building. In 1945, a B25 Bomber that had become lost in the fog crashed into the 79th floor of The Empire State Building on the 34th Street Side. Thirteen people were killed, including three people in the plane. The death toll may have been worse, but (luckily) the accident occurred on a Saturday and most of the offices were empty. The plane impacted the north side of The Empire State Building. However, several structures on it's south side were also damaged as a result of pieces of the plane exiting the building on the side opposite of impact. "New York City. 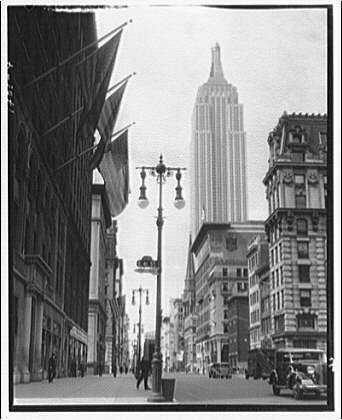 Empire State Building from 41st Street and 5th Avenue." But all of that has nothing much to do with my question. All that is just -- tidbits. So the question -- "Are you afraid of number three?" -- still needs to be explained, doesn't it? I recommend you read on. On September 11th, 2001, terrorists flew two hijacked commercial airplanes into the two towers of the World Trade Center in New York City, NY. The Towers collapsed within a few hours due to the extreme heat caused by the burning jet fuel. Many New York firemen and rescue workers were killed while trying to help save those caught in the buildings. Over five thousand people are presumed dead as a result of these attacks, but fewer than one thousand bodies have been identified. For weeks afterwards, children everywhere were still haunted by the images they had seen of people jumping to their deaths from the upper stories of the burning buildings. On November 12th, 2001, American Airlines flight 587 destined for Santo Domingo crashed into the Rockaway community in Queens, New York, within two minutes of take-off from JFK airport. The crash killed all 260 people aboard the plane. There were five people on the ground at the time of the crash that are now presumed dead. Myself, HONESTLY, I am PETRIFIED OF NUMBER THREE! Me -- the person -- sitting behind this computer screen -- in REALITY -- I'm scared. And when things get too scary, I like to focus in on something that is NOT serious. Something to help lessen the anxiety a bit. And I EVEN HAVE A WAY of looking at it that makes you WILLING TO BE IN THEM!!! What was that? You want to know HOW you would EVER be willing to don a pink fuzzy robe and bunny slippers? Oh, I am SO GLAD you asked that question!!! READ ON AND FIND OUT!!! And you are about to walk right smack dab into the middle of it! Just make sure you haven't forgetten your magnifying glass! "Rules And Guidelines To The Universe Belonging To TobyD." There's an "old wives tale" that says bad things always happen in threes. In my experience, this "old wives tale" has, in fact, proven to be true. Bad things always do seem to happen in threes. "Old wives tales" stem directly from "women's intuition" and are typically believed by most women. Now I know you have heard the term "woman's intuition" used before. You may remember your mother running around at 3:00 a.m. in a pink fuzzy robe and bunny slippers, her face covered in pink night cream, going on about "woman's intuition" when you asked why on God's green earth she got up at that time just to put the car keys in the refrigerator. To a woman, it is completely natural to make a decision based solely on a gut feeling. And a woman will typically not be frightened when the gut feeling turns out to be correct. If the car keys hadn't been put in the refrigerator at 3:00 a.m., your dad wouldn't have been late for work. If your dad hadn't been late getting to work, then he would have been in the building when it blew up. Women will just ride through the reality of having felt the urge to put the keys in the refrigerator in the middle of the night for no logical reason. Women are more capable of simply accepting and incorporating into their daily lives the strange, mysterious, and inexplicable occurrences that happen every single day in this wonderous universe. In short, women can hang with most anything you throw at them, whether it's logical or not. "The world is round, the sky is blue, and everything else is something your mother made up". A woman will, can, and does simply accept the bizarre events in life. A man won't, can't, and doesn't. ... is IN FACT admitting to belief in an "old wives tale". ... is IN FACT admitting to acceptance of "women's intuition". ... is IN FACT admitting to accepting and following "illogical urges". ... is IN FACT admitting to having qualities within himself that are not commonly found in men. ... is IN FACT admitting to having qualities that are commonly found in women. ... is IN FACT admitting to having acknowledged and accepted his "feminine side." and accepted his feminine side while he puts the f'ing car keys in the damn refrigerator. ... are YOU afraid of number three? You THINK about it, then. And you just LET US KNOW!!! God, men make me crazy. Too bad that whole lesbian thing didn't take. ...why don't the rest of us move on to the final film in the tour?